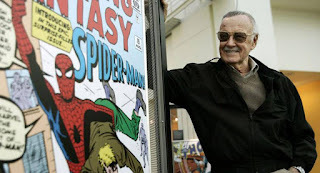 Stan Lee, you were standing in a Stockton comic shop after closing, just you and Bob. Bob was probably going to lock the door as usual but got distracted by your conversation. I saw you, time stopped in my teen mind and I immediately shot over to the dollar bin. You signed a beat up copy of Amazing Tales for me. No hesitation. You shook my hand as I thanked you and apologized to you and Bob for the interruption. You were gracious and genuine. Thank you for getting through my childhood and beyond. Thank you for giving me an avenue to which my overactive creative mind could navigate. With great power, you remained true to the format, stayed within the lines and helped save a billion kids from crippling depression.